Sajeve S. Thomas, MD, is a board-certified medical oncologist and hematologist at UF Health Cancer Center – Orlando Health. He specializes in the treatment of melanoma, sarcoma and gastrointestinal conditions such as neuroendocrine cancer. Dr. Thomas earned his medical degree at University of Florida College of Medicine. 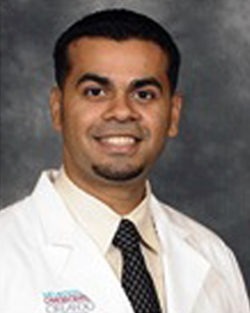 He completed his residency in internal medicine at University of South Florida College of Medicine, where he received the Outstanding Resident award. He completed his hematology and oncology fellowship at University of Florida, where he became chief fellow. Dr. Thomas serves as an assistant professor at both Florida State University College of Medicine and University of Central Florida College of Medicine. He serves as an oncology consultant for various pharmaceutical companies including Merck, Novartis, Genentech and Ipsen. He is also a clinical investigator for the melanoma and GI section of the UF Health Cancer Center – Orlando Health. Dr. Thomas is a member of the American Society of Hematology, the American Society of Clinical Oncology and the American College of Physicians.